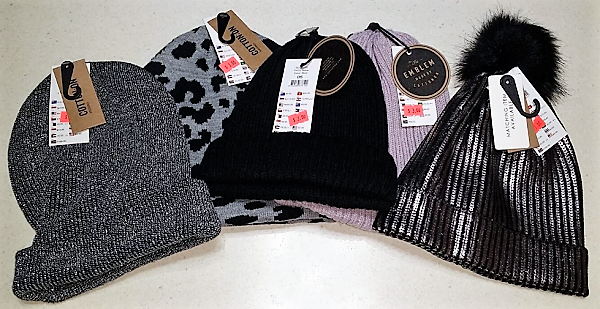 No wonder I was freezing cold much of the time. Two days where the low was over 10C (50F) – that is very cold for where I live. We have not had much rain at all. We have had many days where there were no clouds, so as soon as the sun disappeared the temperature dropped. Thank the deities I found these gorgeous and extremely comfortable boots on sale at Mathers – these are the Colorado Caffara which I managed to score for the massive price of $40 during a sale on an impromptu shopping trip with my parents which came to me as a surprise one Saturday afternoon.. 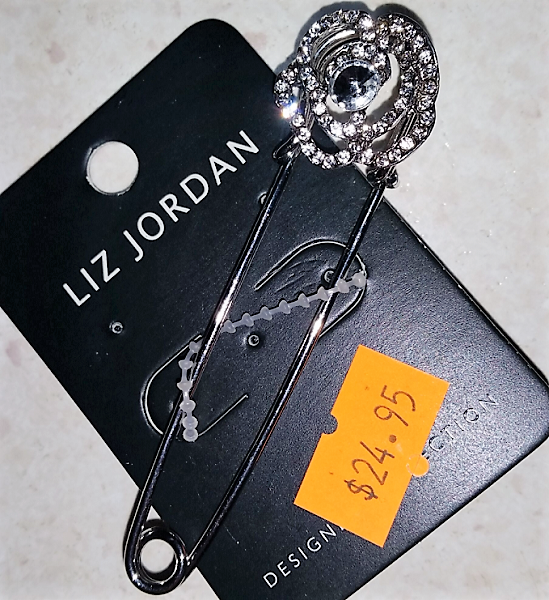 They were originally $249. I have been wearing them a lot lately. 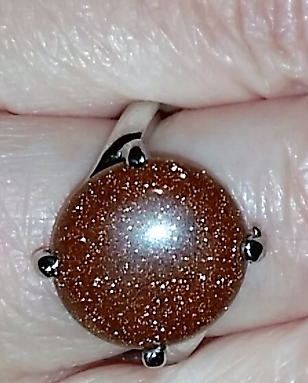 I found this goldstone ring for $10 at a local place – I cannot resist goldstone. It is one of my favourite things. I am planning to see if my favourite rings can be resized soon but until then, I can wear this one. It matches my new boots too. 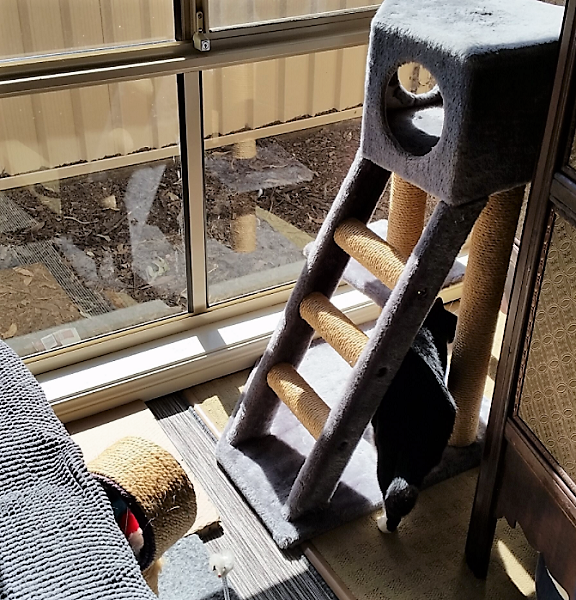 We did a little reorganizing and created a nice sun trap for the kitties which happens to sit right next to the chickens favourite place to hang out and dust bathe when they are free ranging. They can relax and enjoy the warm sun PLUS have chicken entertainment. Most mornings now they are both found somewhere here. They take it in turns for the cat tower, the other cat usually sits on the chairs which are covered by an IKEA bath mat. 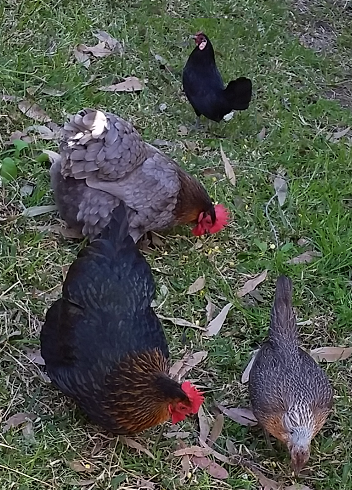 Meanwhile the chookies have just experienced their first blueberries for the season and they were very happy about it. Delicious blueberries = happy chook moments. 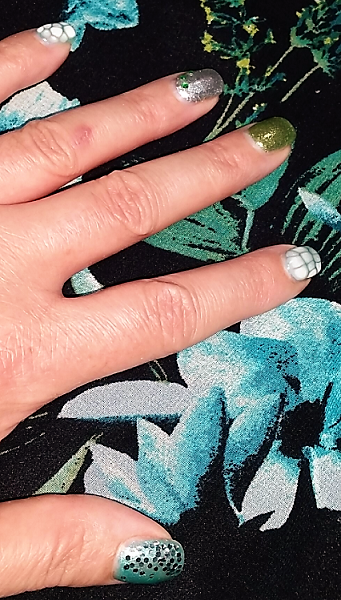 There were two manicures in the month of August – my nail artist opened her own shop this month which was super exciting for her and I am so happy for her. The first manicure was blue with a holographic glitter in it, which threw a rainbow of colours. 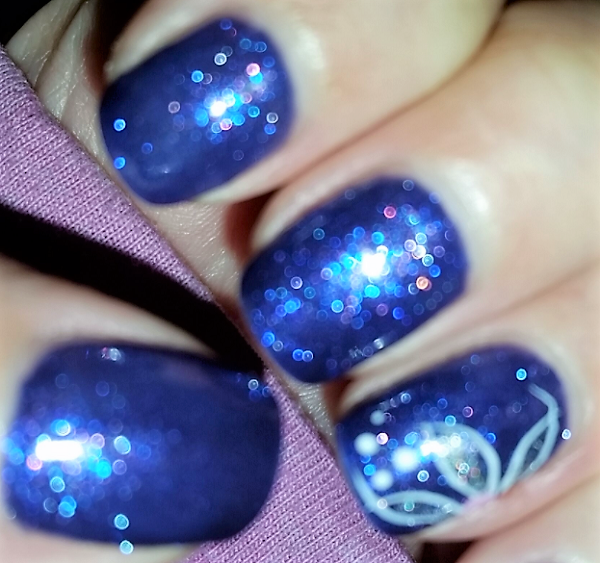 I got 3 full weeks out of this mani, but in the next photo you can see why I like to stick with tips only – see the new growth which has no polish? This particular nail colour also showed me exactly where I use my nails to do things, as parts of it turned pink with wear towards the final week of the manicure. The pinky finger in particular got a lot of wear – I figured out this is where my finger meets my tablet cover and I use my pinky nail to hold it upright while reading at night. It was so weird, there was no change in the thickness of the polish or the quality of it, not at all. Just a colour change. 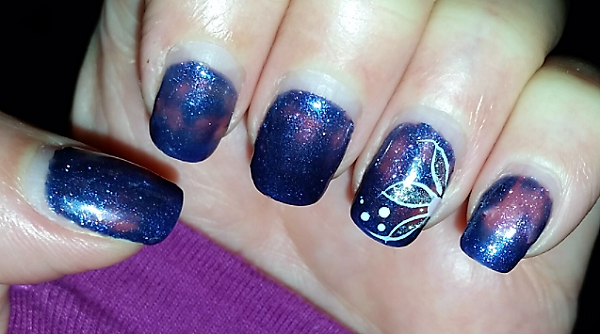 I mentioned the other manicure last week, but here it is pictured resting on the outfit I mentioned. Again it is difficult to take photos of these things and do them justice. You can almost see how it matches this dress perfectly. That is a chiffon tank dress from Millers which I bought in late summer and then the weather got too cold to wear it. I have been thinking about this dress for months, waiting to wear it and finally we got a warm day. The dress and I, plus The Other Half, went to Shellharbour, then we took our new “long way home” which goes via Robertson, where I took the obligatory Big Potato Photo. It was a beautiful day, reaching highs in the 20s. The next day it SNOWED in Robertson, and we suddenly went from 16C to 6.6C here. 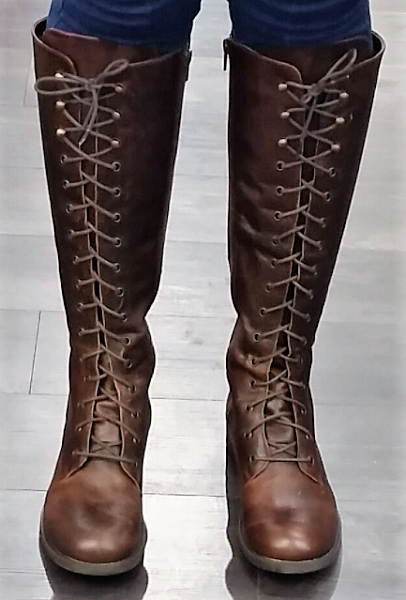 Beautiful boots, but I hope they have a zipper. :) I think I see one. I love your outfit; you are looking great. My nail polish chips a lot, so I bought some of my color from Amazon. Thus, I can touch it up when I need to, not perfectly, but less obvious than chips. I’m not looking forward to winter temps here, although our summer has been TOO hot for me. Too many 90+ degree days. Our temperatures are, of course, quite a lot lower than yours. Until Wednesday we will struggle to reach double digits. And some rain would be very, very welcome. I am awed by your boots, and love your nails. 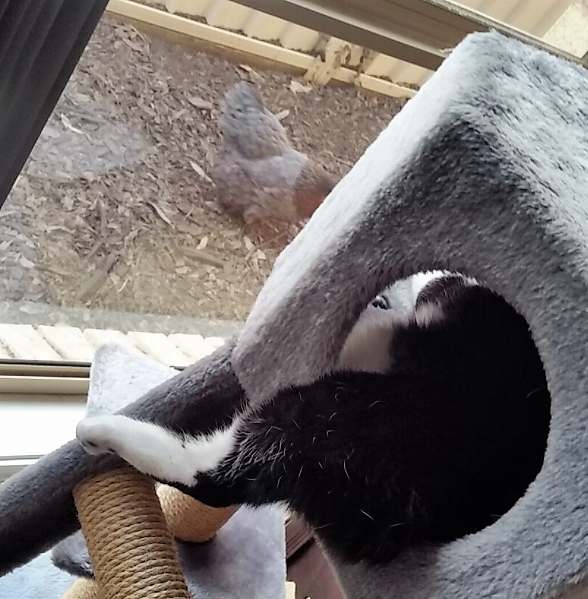 And the chook-watching cat condo. Your kitty tower has better steps than mine. 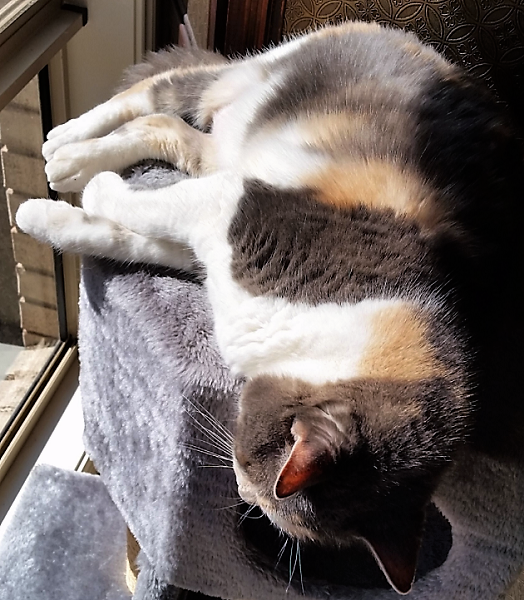 I’d love to move it closer to the window for Lola to be able to bask, but that’s where the couch is and if I move that forward, I lose half my tiny room. Que Sera. 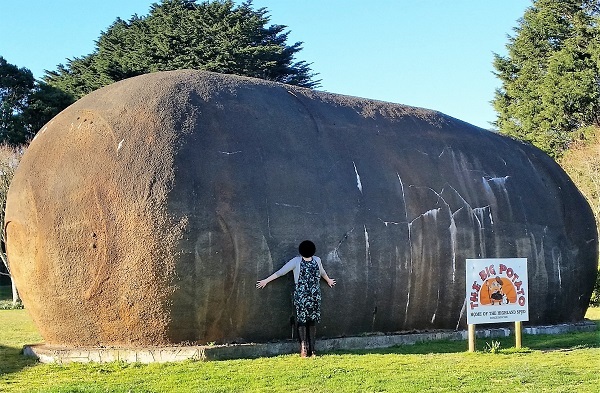 That Big Potato looks more like a concrete bunker to me. Whoever designed/built that needs to spend time with real potatoes, observing the knobby bits, the dents, the eyes and the sprouts. Great photos. Great cats. Great stuff. And wow to the nails and the coordinating outfit.